…so said Ken Hay, CEO of the Edinburgh International Film Festival, after being welcomed to the stage by two of The Young and The Wild ambassadors, Oscar and Maddie, at the start of this year’s EIFF Programme Launch. He went on to talk about the fact that there is such a variety of films at the festival this year, made by film-makers from all walks of life, transcending barriers, whether physical, political or societal, tearing down these walls with the aim purely to share their projects, their passions, on the big screen and get their voices heard. You only have to look at the list of cherry-picked “genre gems” as Artistic Director Mark Adams went through this year's specialist strands. From the British Section, he picked out, amongst others, Calibre - a dark tale set in the Scottish Highlands, In Darkness – starring Natalie Dormer as a blind musician who hears a murder, and Mary Shelley - a biopic of the Frankenstein author starring Elle Fanning. For the American Dreams strand he mentioned Terminal, a noir thriller produced by and starring Margot Robbie, Ideal Home, a comedy starring Steve Coogan and Paul Rudd as a gay couple thrown into parenthood, and Hearts Beat Loud, which is billed as a tale of “Love, Family and Music”. The European strand saw references to C’est La Vie, which will get a wider cinema release after the Festival, and Mug, a quirky film about a Polish man who has a face transplant. His World strand list threw up everything from the 4-hour long Chinese film An Elephant Sitting Still to the latest film by Ben Elton, who is now living and working in Australia. There’s not just new films at the festival as the Retrospective strand goes back to 1980s America, looking at Female Directors in American Cinema, with films such as Fast Times at Ridgemont High and Near Dark. This year’s Retrospective also covers how the US media was portrayed in 1980s films and offers us such classics as Broadcast News, The China Syndrome and, with special permission from Oliver Stone, there will be a screening of Talk Radio. There’s also a sub-strand for American horror movies this year, with a chance to see Day of the Dead, The Howling and more on the big screen again. And that’s before we even get to the Documentaries, the Animations, the Short Films, the talks and special events... there’s just SO MANY FILMS! So I thought I’d pick a few of the “genre gems” (to use the term coined by Mr Adams) that I am looking forward to and settled down with the Programme, a highlighter and a good lunch of a glass of beer and a jam sandwich, thanks to the goodie bag perks from Festival sponsors Innes & Gunn and Mackays. And I highlighted pretty much the whole programme! But I was strict with myself and narrowed my list down to seven must-sees for me (and 6 more maybes and 3 talks, or 4, oh and… ahem) here’s my SEVEN must sees (so far). Jon Hamm stars in this intelligent and absorbing spy thriller, playing troubled and heavy-drinking diplomat-turned-mediator Mason Skiles. When an old friend is kidnapped in Beirut, Skiles is recruited to negotiate and his past comes back to haunt him. Hamm and Rosamund Pike (as Skiles’ CIA handler) make the most of a smart script by Tony Gilroy (writer of the Bourne films), which delves into the dark complexities of the Middle East while offering up plenty of action and clever espionage twists and turns. Charlie Hunnam and Rami Malek star in this harrowing and darkly inspirational updated film version of Henri Charrière’s acclaimed novel. They play prisoners shipped off to a remote penitentiary in 1930s French Guiana who decide to try and escape the prison’s harrowing conditions, where prisoners are routinely brutalised. No simple remake of the 1973 version (which starred Steve McQueen and Dustin Hoffman), this film is powerfully directed by Michael Noer (who made Danish prison drama R) and offers epic dramatic adventure. Actor Brie Larson’s enchanting directorial debut (in which she also stars) got overshadowed by the hoopla surrounding Greta Gerwig’s Ladybird. Larson plays Kit, a unicorn-obsessed art student who must face reality when her art dreams are dashed. An oddball life lesson comes in the form of flamboyant salesman (Samuel L. Jackson), who claims to be able to help her adopt her own unicorn if she fulfils a series of chores and instructions. A quirky and offbeat story that’s delivered with real charm and affection. Timid Zel (Laurie Calvert), adrift in a city with no friends, simultaneously craves and fears intimacy. His eccentric neighbour, Elliot (Billy Zane), offers to help him try and win over dancer Jasmine (Sophie Kennedy Clark) using an experimental form of dream therapy. While this so-called lucid dreaming helps him change and become more confident, his lust leads him on a dark adventure and the question remains as to whether he can charm Jasmine in reality. A striking debut from writer-director Adam Morse. The art, sketches, set designs and storyboards Orson Welles produced throughout his career act as an entry point for director Mark Cousins to delve into the life and career of one of cinema’s most talented filmmakers. Welles trained as an artist before becoming an actor and director, and Cousins has been allowed unprecedented access to a treasure trove of images that provide a fascinating glimpse into Welles’ visual thinking. This film is a journey through his life punctuated by delightful insight. Of course, I’ll add in as many others as I can in my coverage, including lots of great short films, and I’ll definitely try to fit in one or two pure “pot luck” showings, to see if I can find a hidden gem. 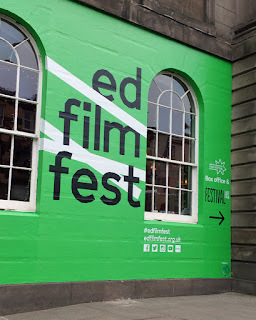 One thing is for sure though, there’s absolutely a real sense of excitement and, in it’s 72nd year, the Edinburgh Film Festival is definitely still young at heart.